Caroline Bragdon is devoted to her job as Director of Neighbor Intervention for the NYC Department of Health, as evidenced by the informative and visually appealing PowerPoint presentation she gave at an Upper East Side community meeting on rat control in February. She gave the 20 audience members clear answers to how many rats can live inside a single burrow (eight to 12) and the safety of poisonous tracking powder (not safe). However, when one man asked about dry ice, she couldn’t hide her frustration. “I don’t think we’re ready yet to talk through that stuff,” Bragdon says. “We’re telling everyone that project is on hold.” Dry ice treatment is safer and more effective than conventional poisons, but it is still not approved by the U.S. Environmental Protection Agency. Two million rats emerge every evening in New York City, according to a statistical analysis by a student at Columbia University in 2014. That’s not the legendary “one rat per person,” but for city officials and many New Yorkers, it’s too many. Last summer, New York City conducted trials using dry ice at Columbus Park, Tompkins Square Park, Seward Park and Jay Wright Hood Park, and well as some other areas in Queens and the Bronx. The results were promising. Columbus Park went from 60 active rat burrows to just two. Tompkins Square Park started July with 368 burrows and ended the summer with only 20. However, the federal government intervened in the fall. Last November, the EPA ordered New York and other states around the country to stop using dry ice as a pest control. The standoff continues to this day. Many rats are still reemerging from their winter dormancy — bringing parasites and pathogens with them. Rats spread diseases such as leptospirosis, a bacterial disease that can lead to brain and other organ failure. (A person in the Bronx died from the disease in February.) They cause countless electrical problems and subway delays by nibbling at the wires that power New York City. Dry ice could be part of a solution, if it ever gets through the lengthy bureaucratic process required by U.S. law. As Bragdon explained to the Upper East Side residents, rats live with their families in anti-skyscrapers — burrows that usually reach about one and a half feet underground, though according to Colonial Pest Control they can go deeper if the rats are navigating around underground obstacles. Last summer, city workers placed dry ice at the rat burrow entrances. The dry ice melts into cold carbon dioxide gas, which is heavier than air and sinks into the burrows. Anything is fatal in large enough doses, especially when it crowds out the roughly 20 percent of oxygen in the air to which all animals are accustomed. The rats suffocate. This approach to pest control differs from traditional rodenticides, which kill rats when they ingest poisoned foods and internally bleed to death. Unfortunately for us, rats are smart and they can learn from each other. A rat that observes a peer dying after eating a certain food will avoid that food in the future, according to Bastiann Meerburg, an environmental health researcher at Wageningen University in the Netherlands. Therefore, in the 1950s, pesticide researchers developed poisons that work only after several doses — the rat has to keep coming back for more. Most pest controllers today use secondary anticoagulants. They set up in a rat’s dream snack spot, with lots of traps deliberately positioned in dark corners with a hidden treat. The rat has to eat the poison for about five to 14 days, according to Meerburg. It keeps the rat’s blood from clotting properly, which leads to internal bleeding. The rat eventually crawls back to its home and dies, which is unfortunate if the rat shares a home with humans who have sensitive noses. “From a hygienic perspective, it’s not a very good thing,” says Meerburg. The smell of dead rats is not the only problem with secondary anticoagulants. They can also kill the carnivores that eat the rats. Even if the poison from each rat is not a heavy enough dose to affect the predator immediately, the cumulative effects can be deadly. A female red-tailed hawk died slowly and horribly in front of bystanders in Central Park in 2012 due to anticoagulant rat poison, according to a necroscopy from the Department of Environmental Conservation. 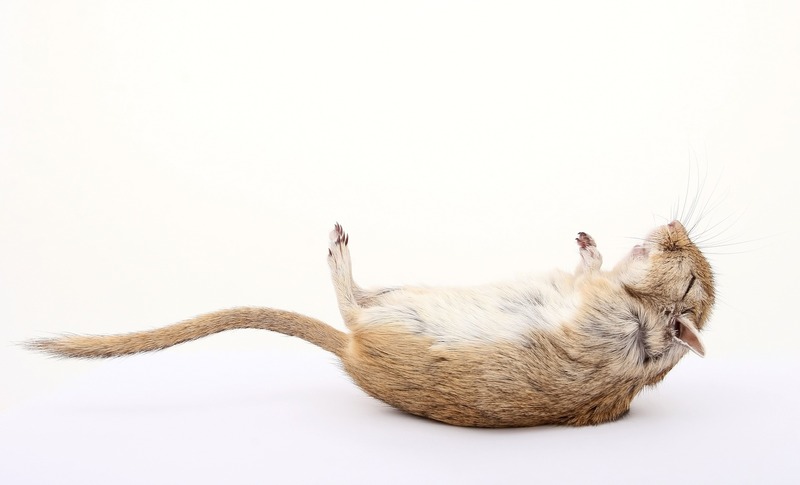 The EPA documented more than 300 animals that died between 1993 and 2004 from an overdose of rodenticide, some of which were members of endangered species. The carbon dioxide gas that dissolves from blocks of dry ice, however, does not poison wild scavengers or predators that may want to munch on a dead rat — unless, of course, they’re in the wrong burrow at the wrong time. There’s yet another problem with secondary anticoagulants. Rats can breed incredibly fast — a brown rat pair can have up to 2,000 offspring a year. A certain rat poison may kill most rats, but inevitably leaves a hearty few that can then pass on their poison-resistant genes. Over a relatively short period of time, rats can adapt to whatever poisons we throw at them, according to Meerburg. Not everyone thinks that the EPA’s long, bureaucratic process is a bad thing. Ruth Kurzee, Executive Director of the Midwest Pesticide Action Center, says that she isn’t that worried about the safety and efficacy of dry ice, but thinks that the EPA should put frozen carbon dioxide through full and rigorous testing. “There’s a real concern about circumventing regulations that are tried and true anyway,” she says. Timothy Wong, technical director at the pest control company M&M Environmental, doubts the practicality of widespread dry ice use. “It’s heavy, it’s difficult to handle, and I’m not sure it’s necessarily safe,” he says. Some pest control experts push back against the idea that it is right to get rid of rats at all. “Killing doesn’t solve the problem,” says Cynthia Palmer, director of pesticide science and regulation for the American Bird Conservancy. Not only are there animal welfare issues, if you care about the welfare of rats, but there are also practical concerns. Rats breed so fast that a habitat gap left by a dead rat can be filled almost instantaneously.